It’s like shooting a bow and arrows: A Spring Grove couple is taking aim at a delicious new trend in the food industry and hoping to hit the sweet spot, right in the middle of their target. Their business, Dough & Arrows, opened in May, serving homemade edible cookie dough along with one of Pennsylvania’s most highly regarded ice creams from Penn State Creamery. “Arrows are a metaphor for us, that no matter what happens in life, whether you feel like you’re [dragged]backward or down, to remember that an arrow, when launched, keeps moving forward through it all, until it hits the target,” says Co-owner John Watson. New Year’s Day seemed like the perfect day for Amanda and John Watson to make a resolution and launch a new business in 2018. The couple had always wanted to open an ice cream shop. On Jan. 2, when John began inquiring about potential real estate and shop locations, he learned that only one hour earlier, a yogurt shop owner decided to close his business. It was the perfect opportunity and location—in Penn Township’s Grandview Plaza—so the Watsons jumped at the chance to renovate the space. 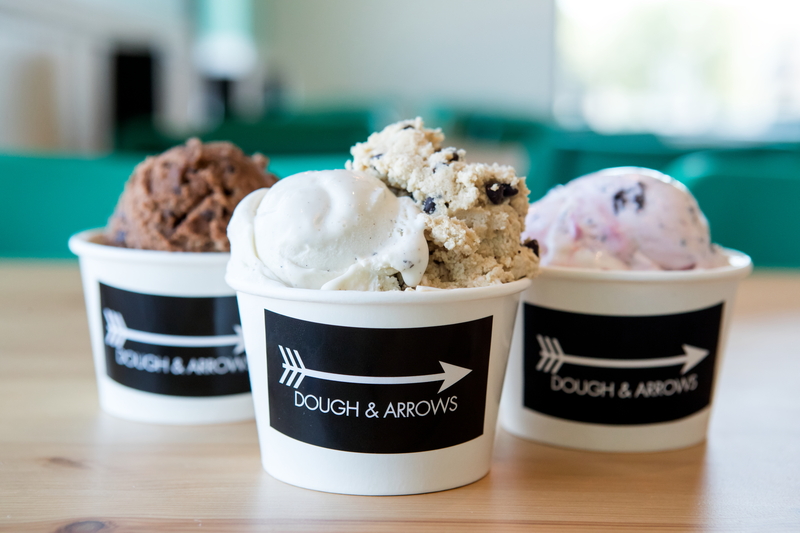 Dough & Arrows was born—a play on words on several levels: Cookie dough is the shop’s unique, star product. The expression rhymes with the phrase “bow and arrows,” pictured throughout the shop’s decor. Amanda’s design skills shine throughout the shop; the couple also owns a wholesale seasonal decor business that utilizes Amanda’s creative talents. But it’s the creative flavors that shine at Dough & Arrows. Nine varieties of cookie dough rotate through the menu including unique combinations like Brownie Batter, Sugar Cookie, S’mores, Peanut Butter, and colorful Cookie Monster featuring blue dough and bright M&Ms. “Chocolate chip cookie dough is definitely the top flavor,” says Brooke Senft, shop manager and Amanda’s sister. “Each flavor has a following and is popular in its own way.” All of the cookie dough is completely safe and edible, as it contains no raw eggs; the flour is toasted so there’s no chance of bacteria. Brooke says the recipes require that ingredients be blended in a very specific order. So, why is the cookie dough dessert trend so popular? “It’s because you weren’t allowed to eat it growing up,” says Senft. “Your parents’ rules about it are out the window and you’re free to indulge,” adds John. In this family-owned business, they finish each other’s sentences, and there’s a lot of joking and laughing. “Cookie dough is very rich, so we started with a recipe that was very whippy. It took many trial runs and tweaking based upon customer feedback,” says Amanda. Now that the base recipe is tried and true, she says new flavors are in the works. Coming soon: Sea Salt Caramel, Mint Chocolate Chip, and Triple Chocolate. “We encourage new customers to try a scoop of each (one scoop of cookie dough and one scoop of ice cream) for their first visit,” says Amanda. That’s because the richness of the cookie dough plays off the creaminess of the ice cream; the creative combinations are deliciously endless. Strawberry ice cream paired with a scoop of sugar cookie dough is one of the most popular combos. During our first visit, we sampled S’mores cookie dough paired with Penn State Creamery’s WPSU Coffee Break ice cream. The flavors blended in a deliciously unique combination of coffee, chocolate, and graham crackers. “The ice cream is selling faster than we thought,” Amanda says, thanks to the popularity and reputation of Penn State’s freshly made ice cream. Many customers are either current Penn State University students or alumni magically transported back to Happy Valley via their taste buds. John drives to the creamery once a week, packing the tubs in dry ice for the drive home. “I think it’s the best in the world not just the state,” says John. Penn State Berkey Creamery, the nation’s largest university creamery, was established in 1865. “Penn State’s creative ice cream flavors go with our shop’s vibe, our unique flavors,” says Senft. Death by Chocolate and Vanilla Bean are the most in-demand ice cream flavors; rotating selections also include Monkey Business (banana ice cream with peanut butter swirls and chocolate chunks), Peachy Paterno, and more. Milkshakes, root beer floats, toppings, and Arrowheads (similar to a Dairy Queen Blizzard) are also on the Dough & Arrows menu. Now that the Hanover shop is a reality, the Watsons are setting their sights on bigger targets including event nights, fundraisers, and birthday parties. They’re also laying the groundwork for franchise opportunities, building the Dough & Arrows business for their children. Married for 16 years, the Watsons have five children ranging in age from five to 16. The two oldest children already work behind the counter at Dough & Arrows. “Working together has its challenges, but we share the same vision,” says Amanda. “When you work with your best friend for 16 years it becomes second nature,” John adds. “Actually, we don’t consider it work.” Sounds like a sweet recipe for success.